It’s just an Instagram contest you’ll never win. What’s the harm? 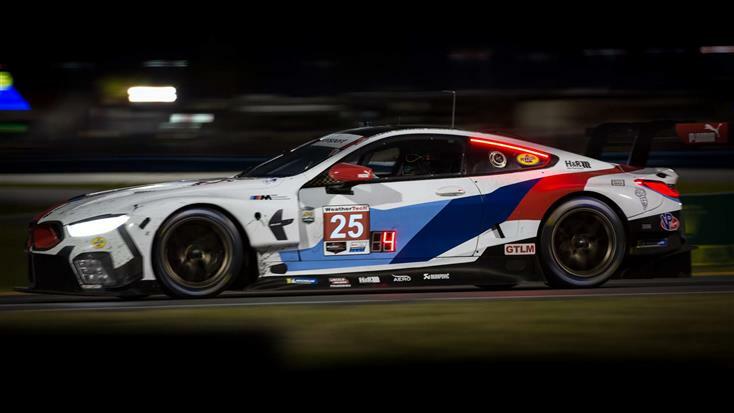 I saw a notification that my friend Kevin tagged me in a contest to win a trip to experience the Rolex 24 in Daytona courtesy of Audi Canada. I wondered to myself if it was worth tagging him back and entering myself. No one ever wins these things, right? I certainly don’t know anyone who did. Nothing this big, at least. But I thought, whatever, I’ll return the favour and just read about the race later. A week later on a Saturday morning, still hazy eyed and laying in bed, I reached for my phone to check the time and go through the usual morning routine of checking the millennial essentials – email and social media. I noticed I was followed by Audi Canada. I had completely forgotten about the contest by this point. Then I noticed I had a message. Lo and behold, it was a note from the company congratulating me saying I had won. There was no way I was seeing this correctly. I closed Instagram and opened it again. The message was still there, from Audi Canada’s verified account. It must have been a mistake. There’s no way. But indeed it was true. My luck rarely pans out. Let alone for something this significant. I excitedly called Kevin and told him the good news. I was still in shock. It wasn’t until all the flight details were sorted out that it finally sunk in that this was happening. Here in Canada, motorsports and car culture isn’t as big as it is down south. Many of our country’s best known races like the Targa Newfoundland or the Honda Indy take place on closed off streets repurposed into courses. The Canadian International Auto Show, while a massive draw, is not as large as other major shows from around the world like Detroit, Geneva and Tokyo’s. That’s not to say it’s non-existent. It just doesn’t exist to the capacity that we see elsewhere in the world, especially in America. Walking up to the entry gate to the Daytona International Speedway was overwhelming and awe inspiring. I’d never seen such a massive structure dedicated solely to motorsport. It dwarfed all the event spaces I had seen locally like the Rogers Centre (or Skydome for many of us). The Speedway can host just under 168,000 spectators. It’s the largest outdoor stadium in the state of Florida and among the largest in all of America. 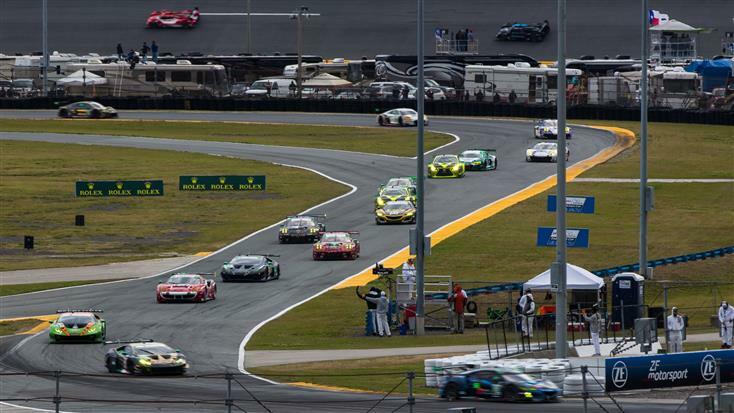 And of course, it’s also home to historic races including the prestigious Daytona 500 Nascar race and indeed, the Rolex 24. 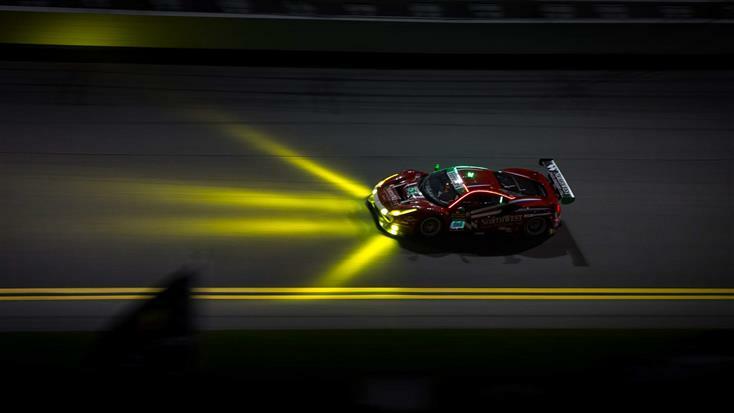 As part of the Rolex 24 festivities, a number of manufacturers taking part in the race set up booths to show off their newest and hottest cars including Audi, Mazda, Lamborghini, Porsche, Lexus, Ford and Mazda. We hopped on a golf cart and rode through the makeshift motor home park set up to allow spectators to camp for the entirety of the race. It was truly massive. What seemed like hundreds of motor homes, each containing multiple race fans, were parked up with stretches of track running alongside them. Only a fence and a small stretch of grass separating the two. When the race would eventually start, the sound of the cars going by would literally shake you to your core, in the best possible way. It’s like a thundering wall of sound hitting you as each racer zooms by. It’s incredible and almost indescribable. 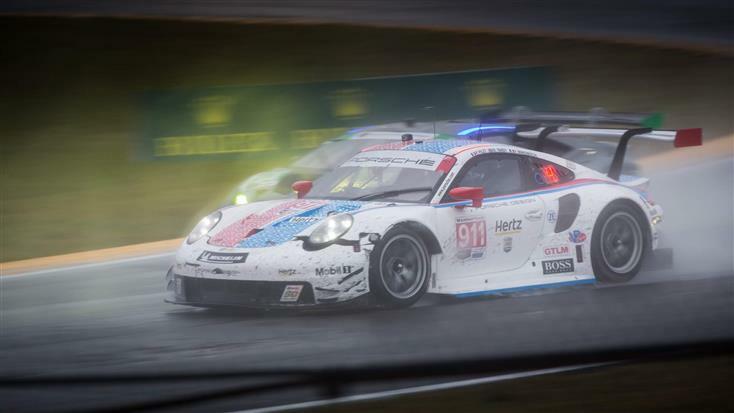 But before the most famous words in motorsport history would be uttered, we got a chance to get a closer look at the cars, the teams and their drivers preparing for the grueling 24 hours ahead of them. Walking through the team garages is a dream for any motorsports fan. Getting an up close, intimate look at the vehicles in the flesh, watching the mechanics finesse and tune them and seeing the massive stock of extra tires, wheels and spare parts that will be needed in the day ahead give a real sense to the sheer amount of work that each team puts in. Racing is about far more than just the drivers. But speaking of drivers, walking the garage sometimes lets you get a peek at the drivers preparing for what’s to come. As we walked through, my friend spotted Fernando Alonso casually walking by. We also saw Alex Zanardi with several of his teammates. He lost his legs in an accident in 2001 but triumphantly returned to racing just two years later. Though the race hadn’t started yet, the roar of engines whipping around the track was still evident. A number of historic race cars, including my personal favourite, a BMW 3.0 CSL ‘Batmobile’ went around the track with a signature sputtering rumble that you might only get on a vintage car or motorcycle. As is often the case with older cars, they can be finicky at the best of times. We soon saw one of the cars, a classic Porsche 911, being towed through to its respective garage. Once the vintage cars were done, we made our way to the track itself for an unforgettable experience – a hot lap. Not in a fully-fledged race car, mind you, but an Audi RS3. Which is certainly not anything to scoff at. Riding with me for the hot lap was Kevin and Audi Canada’s president, Giorgio Delucci. Our driver was calm from the start, but as soon as we began approaching the first bend of the track, the RS3 was pushed to its limits. We hit the apex of the corner and the car slid, but the driver, being a pro, was in complete control of himself and of the car. What would be terrifying on a normal road was fun in this case. At one point, we caught up to Audi’s second hot lap car, a blue RS3. Both drivers approached a bend and went into an almost parallel drift. It was exhilarating to see a car sliding side by side with you in such a controlled manner. 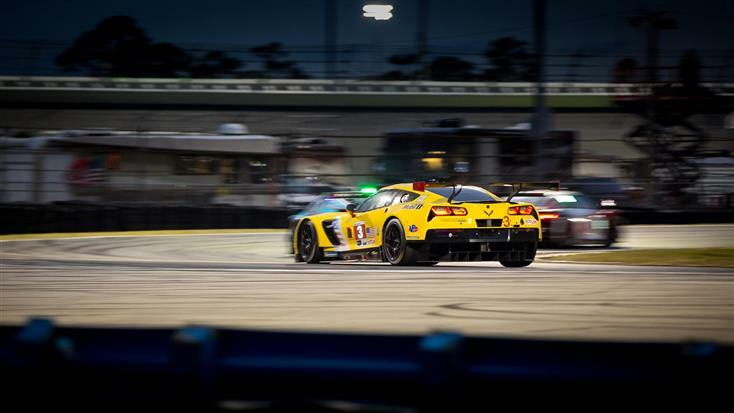 What’s more – shortly after the double drift, we hit Daytona’s 31-degree bank. You could almost feel the blood inside your head shift. After our organs and bodily fluids shifted back into place we headed to Audi’s suite to watch the start of the race. All the cars were pushed to their starting position on the grid. Though we all know and expect it, hearing the announcer enthusiastically yell ‘start your engines’ is spine tingling. The infamous words were a prelude to the crack of thunder that echoed throughout the race track. And it would only get louder from there. 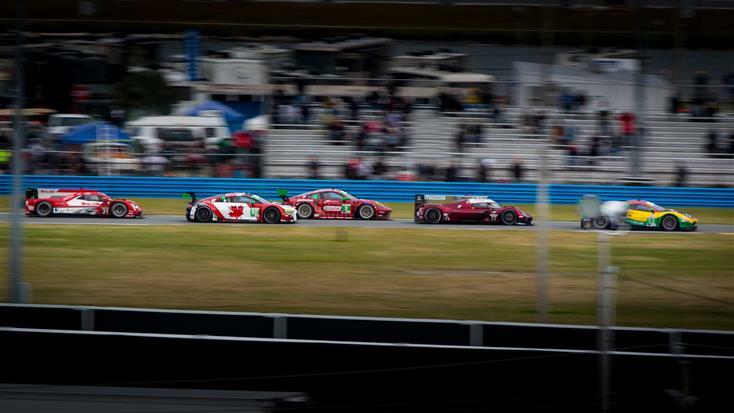 The drone of each race car pacing around the track gave way to a cacophony of crackles, snarls and virtually any engine related onomatopoeia you can think of. On the occasions when a yellow flag was waved and the track had to be cleared of debris or a felled race car, the vehicles would slowly circle around in a convoy. When the flag was lifted, it was as if a wall of thunder was approaching. You could feel it reverberate throughout your entire body. 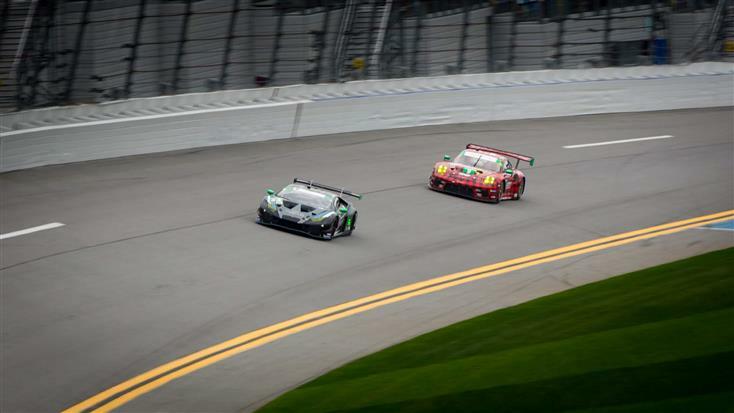 This year’s Rolex 24 at Daytona was an especially significant one. 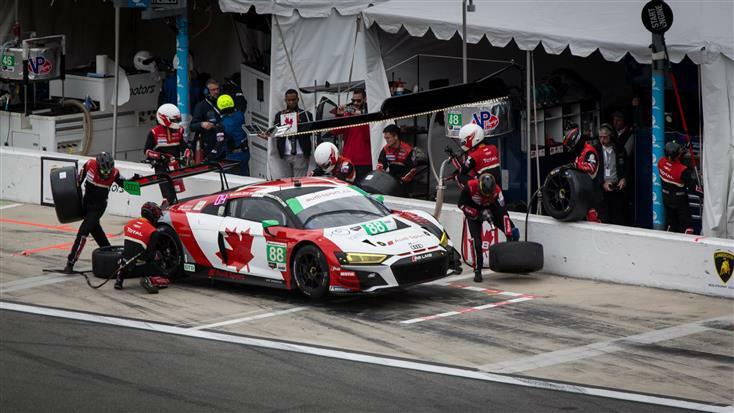 For Audi Canada, it was their first time participating in the race as a distinctively Canadian team. As if the giant maple leaf emblazoned on the sides of their R8 LMS GT3 wasn’t enough of a giveaway. The move was made partly to announce a program that lets customers buy track ready Audis without having to leave the country. The race also marked an historic anniversary for IMSA, the International Motor Sport Association, who celebrated 50 years with this Rolex 24. The anniversary brought out a number of celebrations and special guests including the aforementioned Fernando Alonso, Alex Zanardi and Rubens Barrichello. 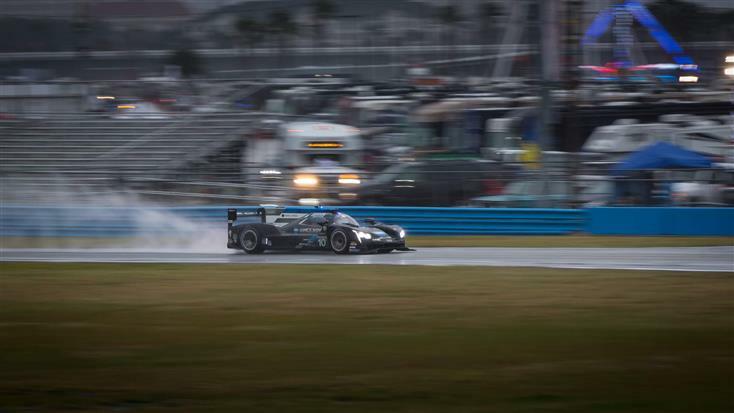 Sunday at Daytona saw the weather take a turn for the worst. Heavy downpour meant lots of soaked feet, chilled bodies and slips and slides on the track. As we ate breakfast, a red flag was waved because of the weather. 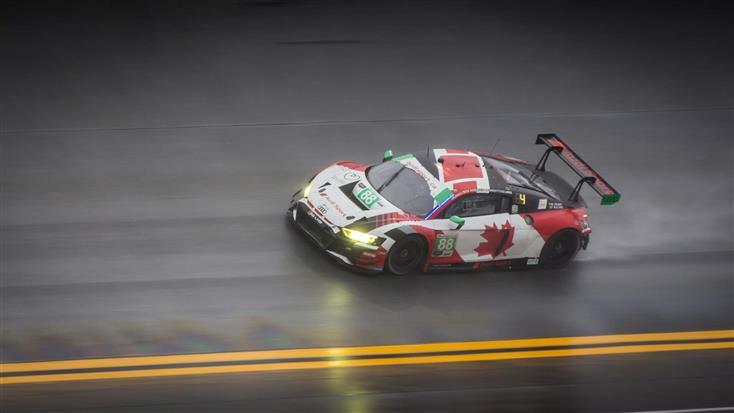 These kinds of conditions are what Audi Canada’s racer were made for, but it didn’t get a chance to show off its capabilities as the vehicles paraded around in a slow loop around the track. 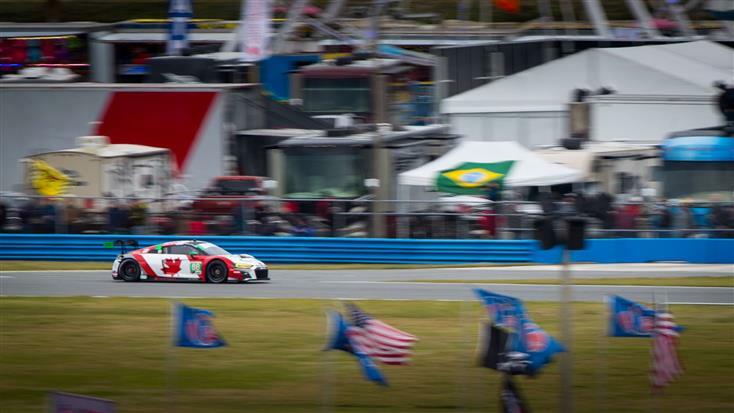 We heard Audi Canada’s president utter “unacceptable” as the red flag continued. Despite the slow racing, we were given an opportunity to walk through the pit lane and take a peek at the many minds and bodies it takes to keep a race car going. Millions of dollars of tracking equipment, spare parts, tires, fuel and food were kept on close hand to resupply both the driver and the car. Because the yellow flag was still in effect, we didn’t get to see much action in the pit lane, but it’s still fascinating to see the inner workings. Because of the weather, we also wore garbage bags as makeshift raincoats. The final hours of the race saw on and off periods of racing. A lead held for a period was lost after a corner was taken too widely. Cars were slipping and sliding off the track on to the grass. Another Canadian team, Pfaff Motorsports, unfortunately had to pack their bags after their car was taken out of commission. The race was red flagged twice on this day, which is apparently something that hasn’t ever happened before. With not even 30 minutes left, the race was called. Alonso and his teammates were crowned the winner, each receiving a shiny commemorative Rolex for their efforts. As for Audi Canada, despite starting in 20th, they made their way up to 4th place. Which for a first time team, is nothing short of incredible. Even if you have little to no interest in motorsports, the camaraderie, the noise, the community and the people you meet elevate the experience of attending this race far beyond just watching the cars go around the track. This is a weekend I will never forget, and one I hope to repeat again in the future. Thank you to everyone at Audi Canada for making this weekend possible.